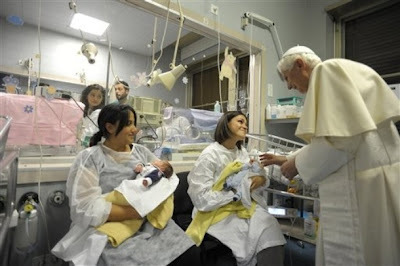 On this eve of the 12th Day of Christmas, the Pope made his previously-announced visit to the pediatric unit of Rome's Gemelli Polyclinic, both to bless a new center for newborns afflicted with spina bifida... and, above all, to bring Epiphany gifts and greetings to the young patients -- many of them joined by their parents -- on Italy's traditional gift-giving feast. According to wire reports, B16 presented an assortment of books, sweets and stuffed animals to the kids, who returned the favor with drawings and puppets for the pontiff. Dear children, parents -- friends! Why have I come to be with you here today, the day we start celebrating the Solemnity of the Epiphany? First of all, to say thanks. Thanks to you kids who've welcomed me: I want to tell you that I love you and that I'm close with you in my prayers and affection, that they might help give you strength in battling illness. I'd like to thank your parents, relatives, the directors and all the staff of the Polyclinic who, with competence and charity take upon themselves the care of human suffering; in particular I'd like to thank those of this pediatric ward and the Center for the care of children with spina bifida. 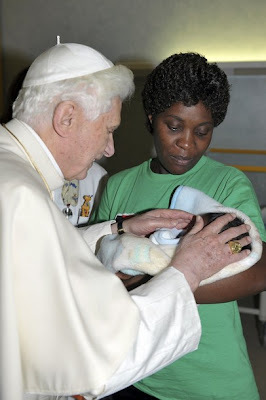 I bless the people, the task and this place where love for the smallest and neediest is carried out in a concrete way. Dear babies and young people, I've also wanted to come see you that I might be a little like the Magi we celebrate on this Epiphany Feast: they brought some gifts to Jesus -- gold, frankincense and myrrh -- to show adoration and love. Today I've also brought you some gifts, that you might feel in them a little sign of the care, the closeness and affection of the Pope. But I would wish that in these Christmas days, all of us, adults and children alike, remember that God has given the greatest gift to each one of us. When we look to the manger of Bethlehem, to the crib, what do we see? Who do we find? There's Mary, there's Joseph, but above all, there's a baby -- small, in need of attention, of care, of love: that baby is Jesus, that baby is God himself who wanted to come to earth to show us how much he loves us; it's God who made himself a child like you to tell you that he's always nearby, to say to each one of us that every baby, every child, carries his face. Now, before I can close, I can't not extend a heartfelt greeting to all the staff and patients of this great hospital. 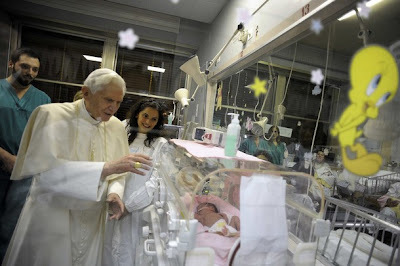 I encourage the many initiatives of good and service here, as well as the institutions that improve the task of serving life; here, I think in particular of the Paul VI International Scientific Institute, founded to promote responsible procreation. Thanks again to everyone! The Pope loves you! At today's General Audience, the message underpinned tonight's visit: that Epiphany calls the church to "joyfully announce" the Word made flesh "by bearing witness to it in our lives." Following a morning Pope-Mass to celebrate the feast -- which ranks alongside Ascension, Pentecost and, indeed, Christmas itself on the scale of the faith's holiest days (all four falling just behind the Paschal Triduum) -- the Vatican's Yuletide observance closes Sunday with the closest thing the Papal Chapel sees to an annual "Family Day": the pontiff's traditional baptism of infants in the Sistine Chapel on the feast of the Baptism of the Lord.